That was the week that was!. Well that was the week that was…..
French air traffic controllers decided that it was time for a strike, it was sunny and they were probably annoyed with everyone else enjoying the sunshine and wanted some vitamin D themselves. Poor Kev fell foul of them, as he landed from a trip on Tuesday morning at 06.30am and was supposed to to hop on the early flight home but, air traffic controllers say no…. and then the 2.30pm was cancelled so he had to wait for the 8.30pm flight, which didn’t actually take off until 12.30am on Wednesday so bless hime he had one of the longest days ever considering he had been up since 8am on the Monday. I headed off to London on Monday avoiding the start of the strike but as you can imagine i was not looking forward to my journey home on Friday, but as luck would have it the strike was called off. But my flight home was still delayed but only by an hour and that was soothed by a few glasses of rose as i dint have to drive home. The weather in June has been stunning, amazing sunshine and temperatures up in the high 30’s, but with that comes the chance of storms and we have had a few, which I’m ok with as they provide fabulous light shows and water the garden which saves me a job. 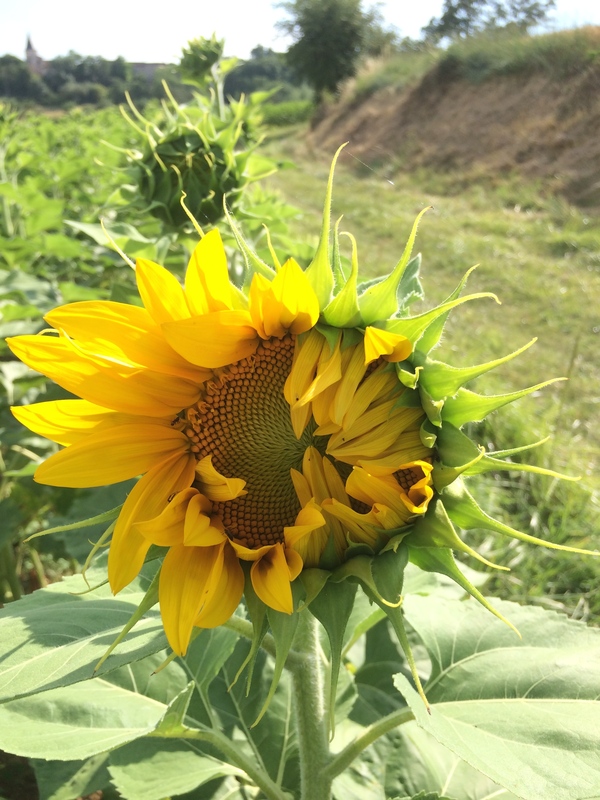 I always like to take a long walk with BP [Barnaby Pickles] on my return home, just to re connect with my surroundings and i always get amazed at how quickly things change, i have only been away for 5 days this week but wow the sunflowers and corn have sit up, they grow so quickly, some of the sunflowers are beginning to burst open to reveal their bright rays of sunshine yellow for us all to see and wonder at. Within a week they will all be out and shining brightly, bathing our countryside in their yellow glow. Miel Miaow never fails to amuse me, she is such a vocal cat and will follow you around chatting away at every opportunity, even BP looks at her as if to say “will you shut up”. 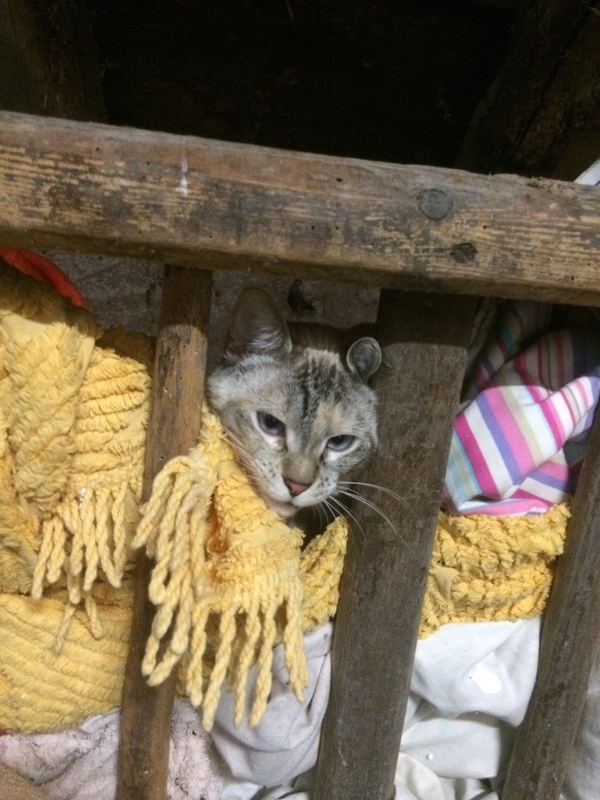 I heard her miaowing the other day in the stables and called her and she popped her head out of a very comfy spot she had found in amongst all of the old blankets we keep as dust covers. We have been very busy working on the pool, but its all boring invisible stuff like sheering up the steps and concreting in the supports etc so no photos to share this week, but hopefully storms permitting we should have made some good progress by the end of the is new week and i will have some pics to share. So that was the week that was and now a new one is fast approaching, so enjoy what is left of your weekend and have a great new week everyone.